When you think about it, our entire lives revolve around selling. Whether we sell as part of our business, serve on a committee of a non-profit organization, or negotiate for a new job/car/house, we are pitching, hearing, and closing deals every day. 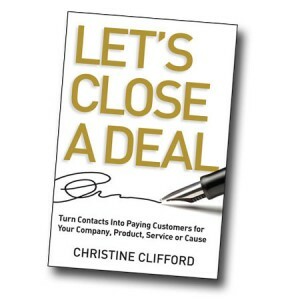 Let’s Close a Deal: Turn Contacts Into Paying Customers for Your Company, Product, Service, or Cause(Wiley, April 2013, $22.95) articulates the intuitive process that identifies how and why a deal will appeal, and then demonstrates in step-by-step detail how to present your deal in a compelling way. The sales process is not about coercion; it’s about compassion. The closing part of a negotiation should honor everyone involved instead of taking advantage of them. 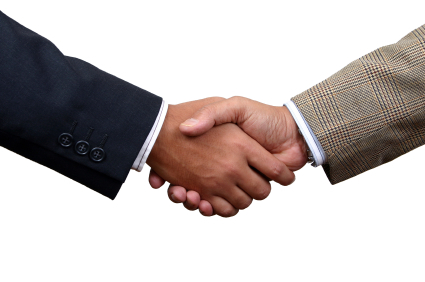 Increase your business’s chance for success by improving your ability to secure profitable partnerships. Let’s Close a Deal shows you how. Christine Clifford (www.christineclifford.com) is an award-winning professional speaker and CEO of Christine Clifford Enterprises. She is the author of eight books including You, Inc.,The Art of Selling Yourself. As a speaker, Christine has presented in 49 states and eleven foreign countries, to over 1,000,000 people. Clients include 3M, Great Clips, Inc., Nordstrom, Council on Aging, and Prudential. Christine speaks to over 50 corporations/ organizations per year. A cancer survivor, she went on to write four humorous books on her story. Once the top salesperson in the multi- billion dollar retail services industry, Christine’s accounts included Kmart, Toys ‘R Us, Wal-Mart, AT&T, Mattel Toys, and Revlon. Taking her company from a million dollar per year loss to over $54 million in sales, Christine signed the largest contract in the industry’s history with Procter & Gamble, doubling the size of her company overnight. Christine is available to speak to your organization about sales, marketing or using humor to get through life’s adversities. She provides sales and marketing consulting, as well as strategic sales training. This entry was posted in Christine's Books on April 15, 2013 by Christine Clifford.